Texas court throws out 1987 murder conviction; declares North Texas man "actually innocent"
Steven Chaney has officially been declared an innocent man after spending more than a quarter century in prison for the 1987 murders of John and Sally Sweek, a crime the Texas Court of Criminal Appeals determined on Wednesday that Chaney never committed. 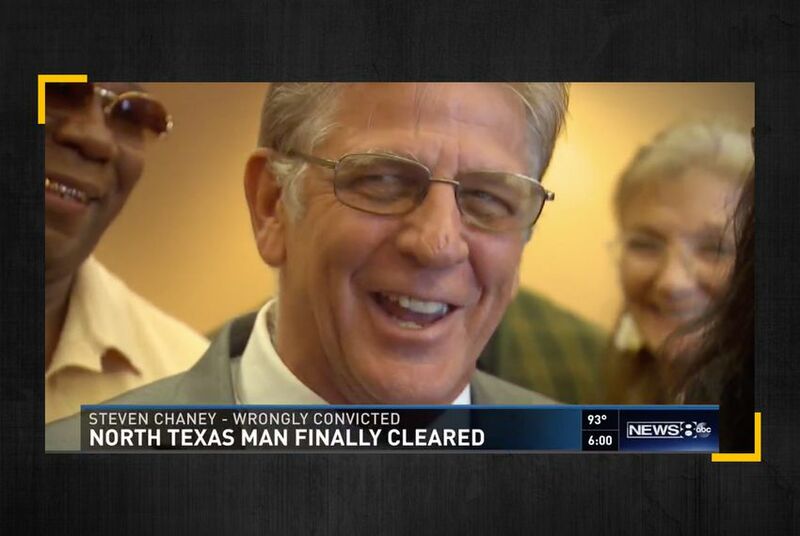 For decades, Chaney claimed he was innocent in the Dallas murders. He was granted relief by the court based in part on questions raised about the testimony of two odontologists’ who said bite marks found on John’s left forearm matched Chaney’s teeth and therefore implicated him in the murder. The state's highest criminal court found that Chaney's conviction largely stemmed from that testimony, and that bite mark science has changed considerably since the time of the trial. “Each piece of the state’s trial evidence is questionable ‘or has since been undermined or completely invalidated,’” Judge Barbara Parker Hervey wrote in a 68-page decision. Chaney's case was eligible for review under the state's "junk science" law, which allows courts to overturn a conviction when the scientific evidence that originally led to the verdict has since changed or been discredited. Chaney was released from prison on bond in October 2015 after his legal team won him partial relief in district court. He spent 26 months waiting for the appeals court to officially find him innocent. That declaration was the “most gratifying part,” Chaney’s attorney Julie Lesser said. Chaney’s case is one of several convictions reviewed in recent years for shaky scientific conclusions since State Sen. John Whitmire, D-Houston, authored the "junk science" law in 2013. In 2016, the women of the “San Antonio Four,” who were convicted of sexual assault and served 15 years in prison, were exonerated. The law also halted Robert Roberson’s execution two years ago, although his case is still under review in county court. In the latest “junk science” case, which was reviewed by the Dallas County district attorney’s Conviction Integrity Unit, the judges concluded that Chaney was innocent based on the defense that it wouldn’t be possible to match bite marks on a person’s skin. The court also discounted additional evidence prosecutors used at trial, including that Chaney’s partial fingerprint and shoe marks were found inside the Sweek apartment. Cynthia Garza, who heads the Dallas Conviction Integrity Unit said, that "justice was done" for Chaney, three years after the Innocence Project encouraged her team to reinvestigate the case. Chaney became a main suspect for the Sweek murders after an anonymous caller encouraged the homicide investigator to pursue him as as main suspect, alleging that he owed the Sweeks drug money. When he was arrested in the following days for unrelated charges, Chaney told investigators he was working the day of the murders, and that he had several witnesses who could defend him, court documents show. After he was questioned and then released, Chaney was again arrested on suspicion of capital murder because the tennis shoes he was wearing resembled the bloody shoe marks found in the Sweek apartment. But following a mistrial, Chaney was found guilty in a second trial. The jury convicted him of murder, handed him a life sentence and fined Chaney $5,000. In its Wednesday decision, the Court of Criminal Appeals officially put the case to rest after 31 years, though the judges are still split over the “Herculean burden” of proving “actual innocence” for future cases. Now in his 60s, Chaney was rehired after his release in 2015 by the construction company he worked at in 1987. He will soon file for compensation from the state, Lesser said.